I sit in the shade watching the action and interaction swirling around me. Most of my attention is focused on one almost three-year old girl. I watch her closely as she runs from one area to another. I follow her as she climbs ladders to twisty slides. I try to hear conversations with other children. This almost three-year old girl, Clara, is my granddaughter and I savor every minute I spend with her. On this day, we are at a park with many options for play. A sand and water table captured her attention. Another girl brought cups and shovels to use with the water and sandy muck. She willingly shares with Clara. I sit back observing the scene around me. Families fill the park. They don’t know that I am watching closely, saving scenes in my memory for a future slice. Surreptitiously, I bring out my phone to snap a few pictures as fodder for my writing. Many nationalities are represented in this park, which explains why I cannot eavesdrop on conversations, as their native language fills the air. I love the multinational world my granddaughter lives in. My nationality and age make me a minority in this park on this day. A young family catches my attention. They have come prepared. The wife carries a backpack and I surmise she is a fan of Thirty-One Totes. Daddy appears to be new to this type of outing, Mommy explains procedures, often. There is only one child to corral, but Mommy is lucky Daddy came to help today. It is a tag-team effort to keep track of Landon. Landon runs from one area to the next with a parent in hot pursuit. He runs with his body tilted forward. You just know he’s going to take a header, but he doesn’t. Mommy tries to entice him by spreading out all sorts of sand toys (many look to be brand new from Christmas). The promise of a snack, brings Landon closer to the encampment. He grabs the snack and heads for a small house with a table. Mommy squeezes into the house with Landon. She gingerly sweeps the table of the sand piles, as Landon wants to set his snack down. Snack consumed, he bolts from the house. Daddy must run after him, since Mommy takes some time to extract herself from the house. Toys remain scattered in the sand to be retrieved later. This encounter makes me aware of how unprepared I was for the park. All I brought was a child and my phone. Next time, maybe I will grab a snack and perhaps a few toys for the sand. 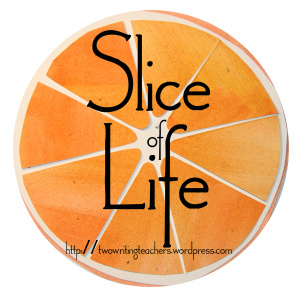 What do taxes, writing workshop, words on classroom walls, and Allie (my daughter-in-law) have in common? They are bits of celebrations I noticed this week. Taxes seem like an odd celebration, and for many years it was a time of pulling hair and gnashing of teeth. That is no longer true. Mine are finished and sent away, but I did not have to labor over the language of the tax code. I know Turbo Tax says it’s simple, but they always asked me for something I don’t understand. I celebrate that someone took my data and turned it into a refund. One day, I will have a surprise increase in my bank statement. I love those kinds of surprises. The past two weeks I’ve been visiting classes to observe writing workshop. It is so lovely to see workshop happening. Students happily, eagerly engaged in writing. Teachers teaching writing and loving it. Several of these classrooms have some sayings on their walls I want to remember. One classroom announces “Mistakes are proof you are trying.” So when I make a mistake, I will remind myself, that at least I’m trying. “You can never have too much happy” is written on the radiator under the windows. Saturday celebrations are proof that there is always room for happy. 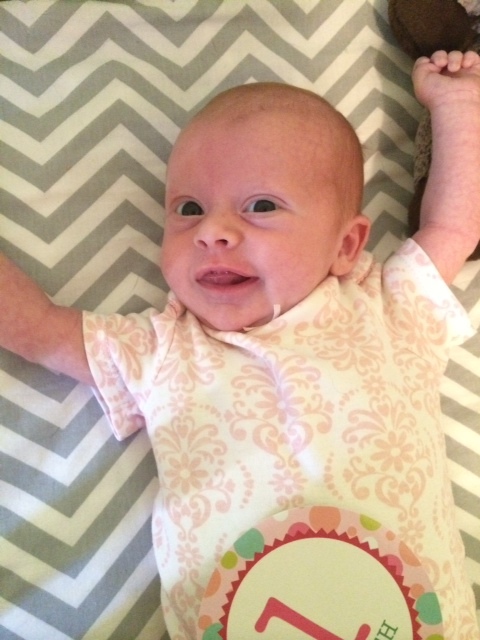 My final celebration is that my daughter-in-law, Allie sends me photos and videos of my granddaughter, Clara. 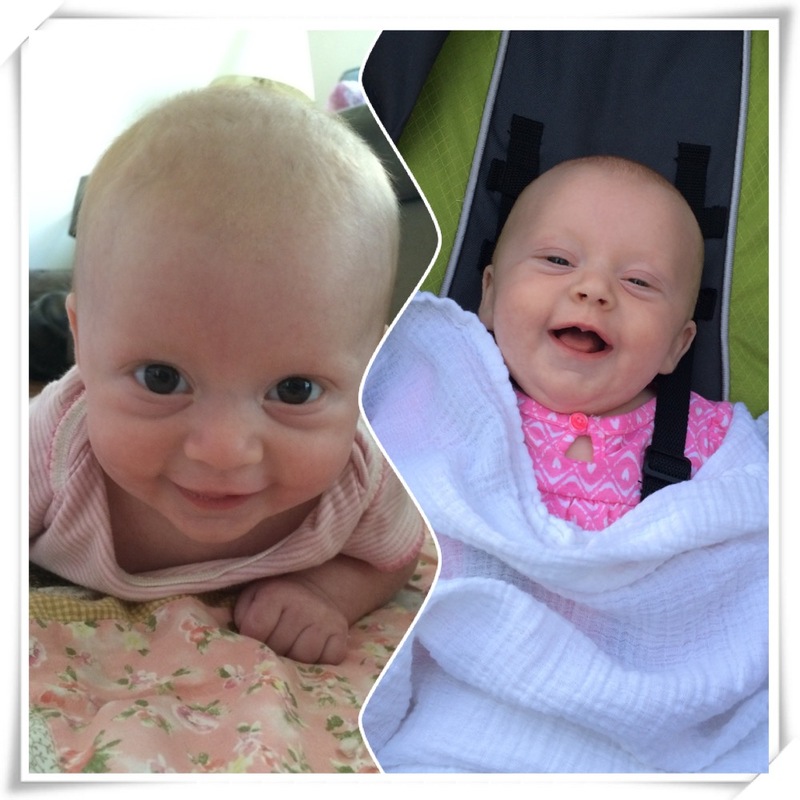 Living 1,500 miles away from them makes us miss a lot of milestones in the granddaughters’ lives. Fortunately, Allie sends me bits, whether it’s a photo or video, of their everyday lives. This week they discovered a new natural park. Apparently Clara loves digging in the mud and exploring the earth. She does have genes of a geologist. One of the most recent videos shows off Clara’s swimming skills, when wearing massive water wings. One evening she began spinning like a top until she was so dizzy she fell down. What a joy these photos and videos bring me! Think about your week. Look for the celebrations that might go unnoticed and take a few seconds to savor in the joy. The text tone on my phone is listed as glass. It sings a high pitched “Ding, ding” whenever a text comes in. Previously, that sound did not raise my heartbeat or send me scurrying to locate my phone. But that’s all changed. Now, anticipation runs high whenever the high pitched ding plays. It could be a picture sent half way across the country bringing my granddaughter into the palm of my hand. Clara was born January 3. We arrived to meet and greet her January 5. 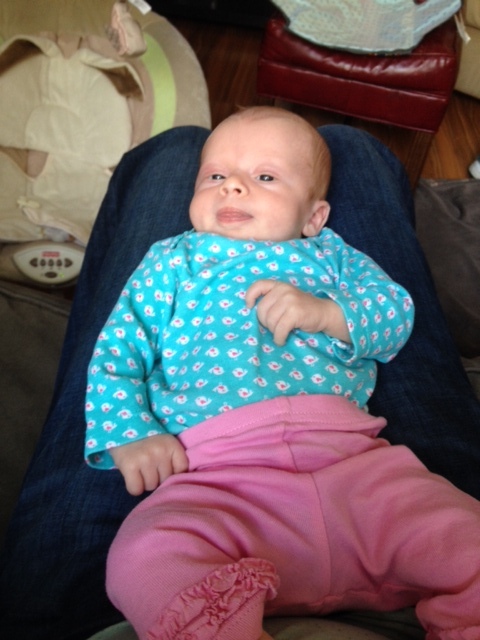 We spent the next four days holding her and savoring every moment with our family in California. Ever since then we have only had photos and videos sent via the phone. I am eternally grateful that we have the technology to bring family closer. 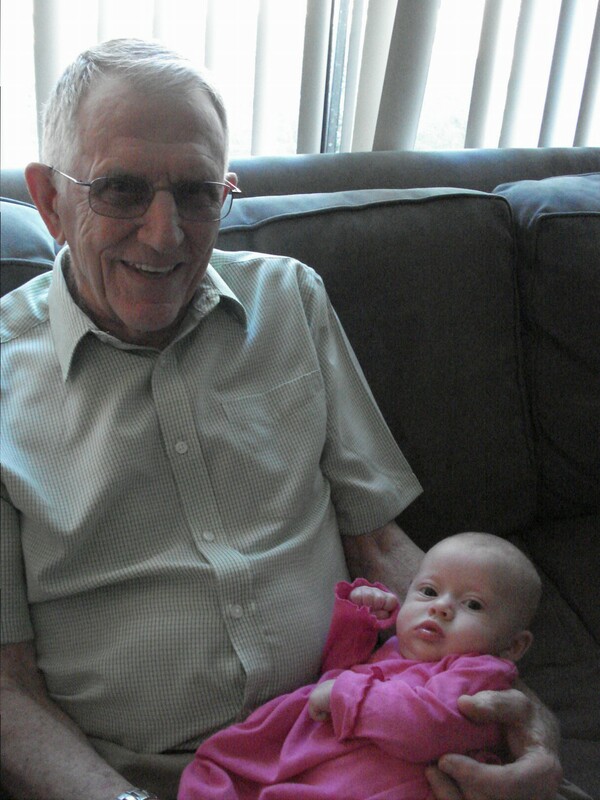 Great grandfather meets his great granddaughter. My phone dings. A text message waits. I glance at the message. I smile. Clara is growing up fast, already at 9 pounds! Now didn’t you smile too? Let me help you smile a bit longer. 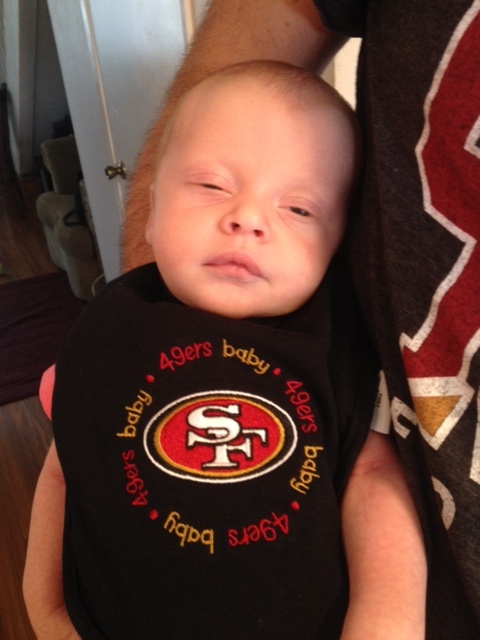 Daddy said it’s hard being a baby during the Super Bowl. Being 1,600 miles away from my son and his family is difficult, but thankfully technology makes it easier to stay connected.